The NAIA National Eligibility Committee has informed Kansas Wesleyan University that it must forfeit two early January women’s basketball victories because a student that participated in those games was not registered in at least 12 hours (full-time status) when those games were played. 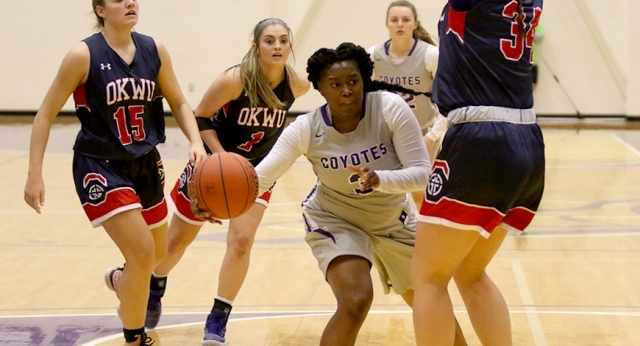 The Coyotes (19-2) defeated York (1-20), 100-54, on Saturday, January 5 and Bethany (10-11), 64-53, on Monday, January 7. The university was not in session on those dates as it was between the fall and spring semesters. In late December, the university registrar, faculty athletics representative, director of athletics and head coach certified the team as eligible for the spring semester, including the student in question. All the team members were registered for 12 hours or more, meeting full-time status. On Friday, January 4, the university canceled a course in which the student was enrolled. The professor had resigned from the university in December and an appropriate adjunct instructor could not be located. The registrar’s office did not follow the appropriate protocol to notify the head coach and/or director of athletics when a class is canceled and a student-athlete falls below full-time status. The office did send an email to the student’s university email address, indicating that she was no longer registered for the course. The student did not read the email until after the two games were completed. The university found the error during an enrollment check following the Bethany game. The university self-reported the violation on January 14. It was reviewed by the KCAC Eligibility Committee before it was forwarded to the NAIA NEC. In addition to the protocol in the registrar’s office, the university had a second safeguard in place. Any time a student-athlete has a change in registration and is no longer a fulltime student, the registrar and head coach receive an automated email on the subsequent day. At the time the course was dropped, the assigned university administrator had not adjusted the program from the fall to spring registration since it was still between terms, so no email was generated. The student was enrolled in an additional course prior to the team’s next game, a 79-66 win over Oklahoma Wesleyan. The forfeiture of the two games drops the Coyotes from 19-3 in the KCAC, good for second place, to 17-5, third place in the conference. “I feel terrible for the student-athletes and coaches in the women’s basketball program who have been building toward this remarkable season over the past few years,” said Mike Hermann, vice president and director of athletics. “Every win is precious and to lose two wins due to an administrative error outside of the athletics program is a high price to pay. “I know this group of coaches and women,” Hermann continued. “They are resilient. I expect them to use this as a rallying point to continue to push toward their goal of earning a bid to the NAIA National Championship. This week’s #18 ranking in the country and the 19-3 conference record on the court demonstrate that this team is deserving of a bid. While there remains a path to earn the bid on the court through the post-season tournament, I believe they have already earned it. Coach Showman and his student-athletes are not available to comment on this issue. The team returns to action Wednesday with a road game at York and finishes the regular season at home Saturday against Bethany.